On the backs of the consumer and the strengthening labor market, the U.S. economic expansion continues. Weakness and uncertainty remain in terms of the global economy, financial markets and the goods-producing industries. However, as the U.S. economy enters the seventh year of expansion, including the longest string on monthly job gains on record, the outlook remains positive. The ongoing job gains and wage growth are pulling workers back into the economy and measures of slack, or underutilization, show ongoing improvements. Oregon continues to see full-throttle rates of growth. Job gains are outpacing the typical state as are wages for Oregon workers. The state’s economy is quickly approaching full employment, or a healthy labor market. Such a milestone has not been seen since 2000. Encouragingly, underemployment, or those involuntarily working part-time in Oregon is back to pre-Great Recession rates. 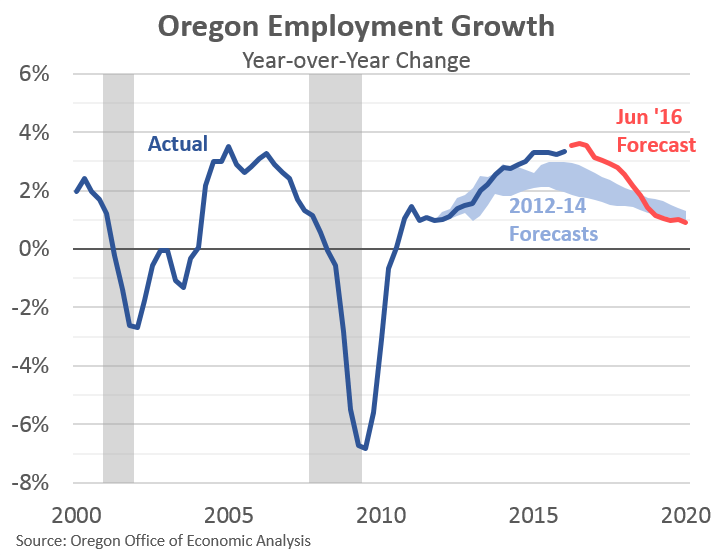 Given the ongoing economic strength in Oregon, the economic outlook has been raised relative to recent forecasts. The state is now expected to maintain these full-throttle rates of growth through the end of 2017 before longer-run demographics weigh on the outlook. Absent the state’s new minimum wage law, passed during the 2016 legislative session, the upward revision to the employment outlook would have been even larger. While the impact is relatively small when compared to the size of the Oregon economy, it does result in approximately 40,000 fewer jobs in 2025 than would have been the case absent the legislation. Our office is not predicting outright job losses, however we are expecting somewhat slower growth. Low-wage workers receiving raises in the near term boost incomes. Over time, however, employers will adjust by increasing worker productivity, possibly via capital for labor substitutions. 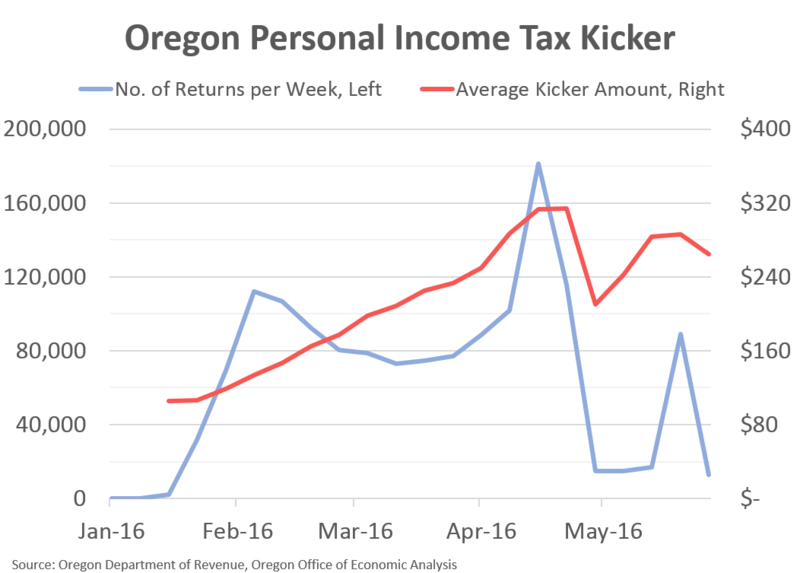 With the first income tax filing season of the 2015-17 biennium now behind us, Oregon’s General Fund revenue collections remain on track with what was expected when the budget was drafted. Personal income tax collections continue to expand at a healthy pace as a result of strong job growth and wage gains. Like the overall economy, Oregon’s revenue gains are among the nation’s strongest, but also, they have not come as a surprise. Personal income tax collections during the filing season came in roughly the same size as last year. However, current collections reflect the payout of kicker credits. If not for the kicker, this season’s collections would have been $300 million larger. Corporate tax collections have started to contract in recent months. Nationwide, corporate profits are falling, largely due to rapid appreciation of the U.S. dollar, and struggles among energy firms and other commodity producers. Even so, corporate tax collections remain large relative to historical norms. Corporate tax revenues are expected to exceed the 2% kicker threshold by $10.4 million, generating a kicker amount of $32.3 million. In addition to healthy General Fund revenue growth, Oregon Lottery sales have been very strong as well. Recent collections have consistently come in above expectations. The 2015-17 Lottery outlook has been revised upward as a result. However the forecast for future biennia has been lowered as the Cowlitz Tribe casino, scheduled to open in spring 2017, is being included in the outlook for the first time. Although General Fund revenues have been tracking very close to expectations to date, the outlook for revenue growth during the upcoming 2017-19 biennium has become somewhat stronger. However current rates of growth are not sustainable indefinitely. As the economy reaches full employment, growth will transition to a more sustainable, long-run path. Over the 10-year forecast horizon, Oregon and other states will face considerable downward pressure on revenue growth as the baby boom population cohort works less and spends less. Revenue growth will fail to match the pace seen in the past.